Customer experience (CX) is the new battlefield and leading organizations are changing their priorities this year to focus on this space, reports Gartner. Gartner Research Center is the voice of selected business decision makers. Participating members have a unique opportunity to provide input and opinions on a variety of IT and other business-related topics. It is based in US. 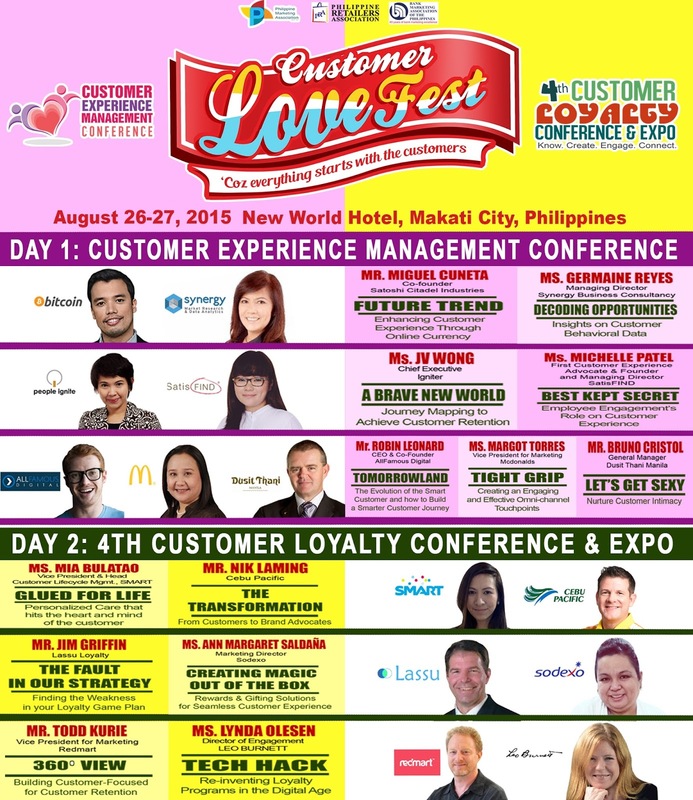 Customer Lovefest was created to further the understanding on how to maximize customer experience management, and customer loyalty and rewards program. Customer Lovefest set this August 27-28,2015 at New World Hotel, Makati City has two conferences, the Customer Experience Management Conference and Customer Loyalty and Rewards Program Conference. The Philippine Marketing Association (PMA), the Philippine Retailers Association (PRA), and the Bank Marketing Association of the Philippines (BMAP) are associations that support this conference. The conference gathers loyalty officers, Chief Marketing Officers (CMO), marketing managers, CRM officers, owners, presidents and members of the academe. The developing consumers sophistication made the customer experience management that business provides become paramount and critical in the business planning. At the same time, consumers want more and wanted to feel that they are valued by the businesses that they are patronizing, this led to the explosive growth of loyalty and rewards program. Everywhere in the world, this marketing and consumer tool has grown supported by the business CRM technology. In the Philippines, loyalty and rewards program is already a must for business establishments in the area of customer retention, and in prolonging the customer lifetime value (CLV). Customer Lovefest provide the on-going answers and edge for business looking how to maximize these two tools. The event media partners are Business World, Malaya Business Insight, United Neon, and Wazzup Pilipinas. Brother Philippines, Netplay Inc., Sodexo Benefits and Rewards and I4 Asia Incorporated support the event. The event is produced and organized by Ex-link Management and Marketing Services Corp. (Exlinkevents) – the business events organizer of the Philippines. For more information and details call tel.no. 643-3887, text mobile no. 0920-9814376 or email at info@exlinkevents.com.